Sean Szymkowski December 2, 2018 Comment Now! It will require years of research and technology implementation before self-driving cars are a common sight. Until then, some automakers aren't only working on the tech itself, but also developing ways for self-driving cars to communicate with pedestrians. 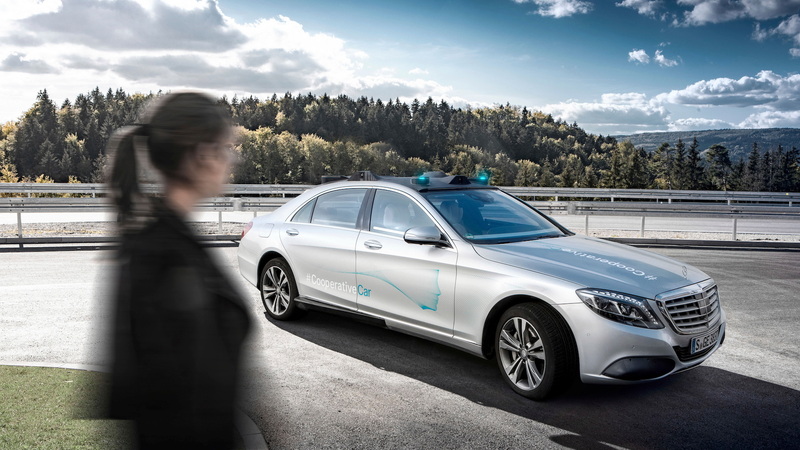 Mercedes-Benz parent Daimler showed off its initial concept for how a self-driving car will communicate with pedestrians and other bystanders while it operates, and it comes down to one thing: eye contact. The German auto giant explained in a Monday announcement that ongoing research showed humans feel most comfortable with self-driving cars if the machine can make "eye contact" with him or her. So, the company developed a 360-degree camera system for a Mercedes S-Class sedan it calls the "Cooperative Car." Jaguar Land Rover has also demonstrated a similar concept, but in a more interesting fashion. 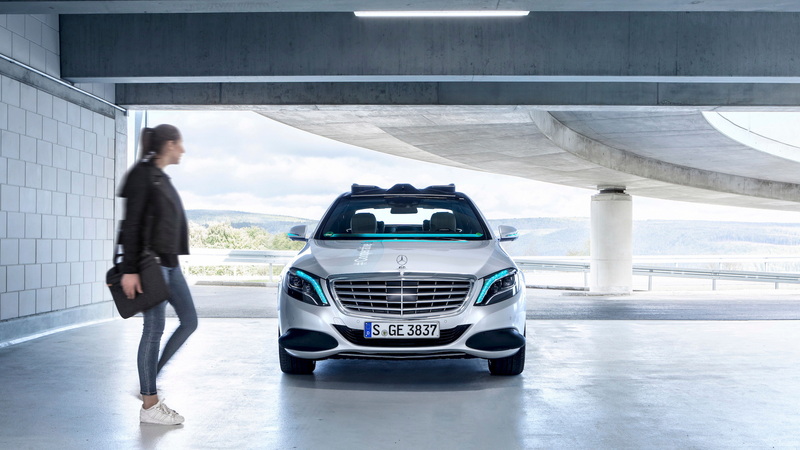 On the Daimler concept, turquoise light strips are present in the windshield, grille, headlights, mirrors, and roof-mounted lamps to communicate with pedestrians. 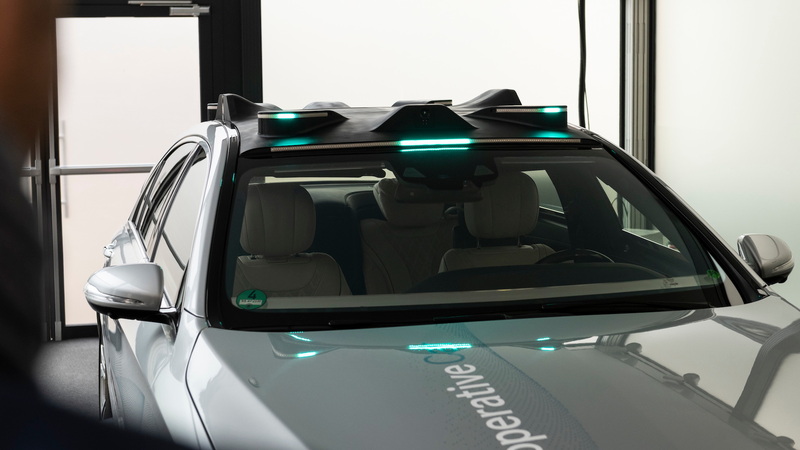 The roof-mounted lights follow pedestrians as they cross to create a human element to the self-driving car. Quite literally, the car watches humans to acknowledge their presence. And the lights flash in various patterns to tell pedestrians the car is not in operation, or driving autonomously. And—here's something somewhat freaky—Daimler also developed a way for the car to "wake up." For example, if a passenger summons a self-driving car, the Mercedes S-Class wakes up by extending the mirrors, lifting the rear of the car, and then the front. It's almost like an animal waking from a brief nap. However, the company said all of these elements helped build trust between research participants and the cars. Pedestrians can understand exactly what the car wants to do via the lights and subjects felt safe with artificial eye contact. In the future, Daimler wants to implement far more advanced signals. It's shown some of its future work with the Mercedes F015 and Vision Urbanetic concepts. The F015 concept, unveiled in 2015, used the front grille as a form of communication, while the Vision Urbanetic, unveiled in September, included "digital shadows"—the ability to display a pedestrian's shadow on the car's body as the 360-degree camera detects him or her. No matter what the standard for machine-to-human communication is, Daimler is determined to make self-driving cars just a little more empathetic. We could see some of this very soon, as the automaker will start its first self-driving service in 2019 in Silicon Valley.